A kid’s Christmas is the best version of Christmas. It’s bright, sparkly, magical, and just plain wonderful. The holidays bring an abundance of the most joyous things in life. There are stockings to be filled, candies to be eaten, and presents to be opened. Parols. Simbang Gabi. Tsokolate. Bibingka and Puto Bumbong. Carols. Overflowing food! I remember how I used to write Santa letters. There was one time I wrote him a few days before Christmas to make my request. I woke up to a disappointing note telling me that I had submitted my letter too late and therefore the elves didn’t have enough time to make my toy. I got a headband instead. Another time, I had gotten a computerized letter from Santa and I remember wondering about that. I imagined Father Christmas typing away in the North Pole because he was too tired to write to each kid in the entire world – smart of him to finally get a computer, eh? I think back to those times with fondness. Waking up to Christmas was always a grand affair, a jumping up and down on the bed then running towards wherever the Christmas tree was. One Christmas, Santa had wrapped all our gifts in Manila paper. Another time, he had left chocolates and candies in our stockings after dropping off our presents. He wasn’t always consistent – sometimes he wrote us, sometimes he didn’t – but just the thought of a jolly old man riding a sleigh across the starry night skies as we all slept made me the happiest kid on earth. I shivered with anticipation every Christmas eve, even daring to stay awake until after midnight to get a glimpse of the man in the red suit. But my parents would always tell me that he wouldn’t appear until we were fast asleep. And that always got me straight to bed. Then I grew up – we all did. Christmas began to lose its luster. The parols were still there. 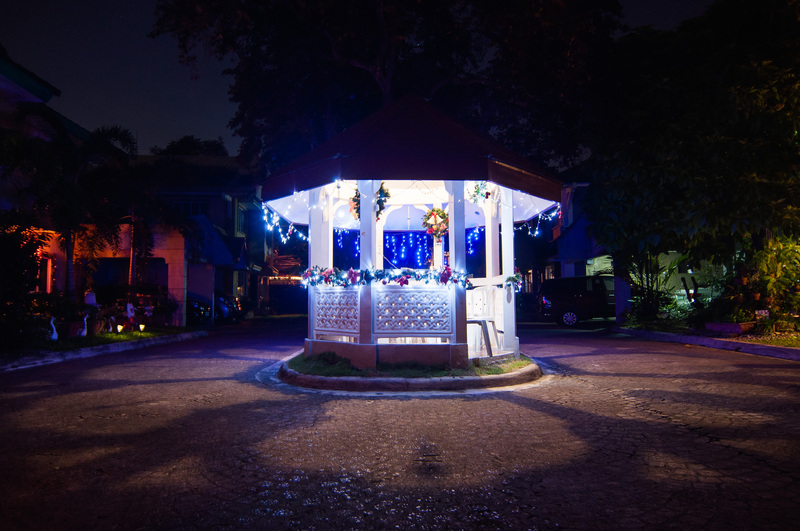 The carols, too, as well as the family gatherings and Simbang Gabi. Yet, I began hearing people my age remarking about not feeling the spirit of Christmas. That it wasn’t as cold as it used to. That traffic and Christmas shopping took away all the fun. That the holidays were no longer the most wonderful time of the year. It became work, a string of long to-do lists and unrealistic expectations founded on a child’s fantasy. And worst of all, I found myself nodding along, agreeing to these observations. Every year, it gets harder. 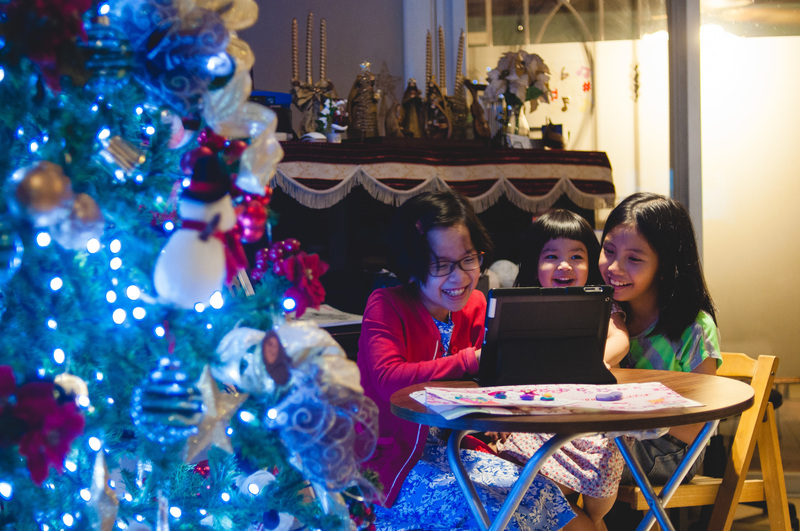 Looking at my younger sister and nieces and nephews at last night’s festivities, I couldn’t help but envy them as they celebrated Christmas – a kid’s version of it – and reveled in the sparkly, tinseled, wonder-filled dream we all used to partake of as children. “It’s all the same,” a friend’s mom sighed as we sipped wine and munched on kasuy nuts in her living room a couple of days ago. The gifts we exchanged with each other lay opened at our feet. 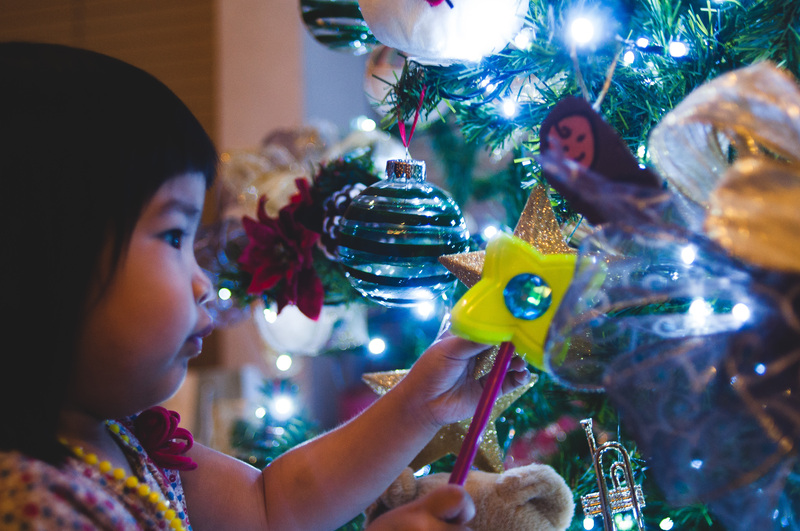 A beautiful Christmas tree decorated with owls, bird’s nests, and clear glass balls that changed color sat silently in the corner as our tita, who had turned sixty earlier this year, shared her woes about the season. It was the same each year: shop for gifts, give gifts, get gifts, go to mass, and that’s it. There were five of us in the room, a bunch of 20-year-olds and one sixty-year-old. Monica, to relieve the tension, broke into a smile and said that it wasn’t all bad, that we still needed to look for the good in it. After some cheer and encouragement from the rest of the group, Tita conceded, gave a half-hearted “maybe,” mumbling something about age being a factor before downing some wine. I wonder sometimes what it is about growing up that changes our perception of Christmas. I still love it, but it’s different, so very different from the way I loved it as a kid. John and I were talking about it yesterday. Unlike gullible me, he always suspected Santa wasn’t real. But Christmas still changed for him all the same when he entered adulthood. I suppose it’s the transition from gift-receiving to gift-giving that made the difference. 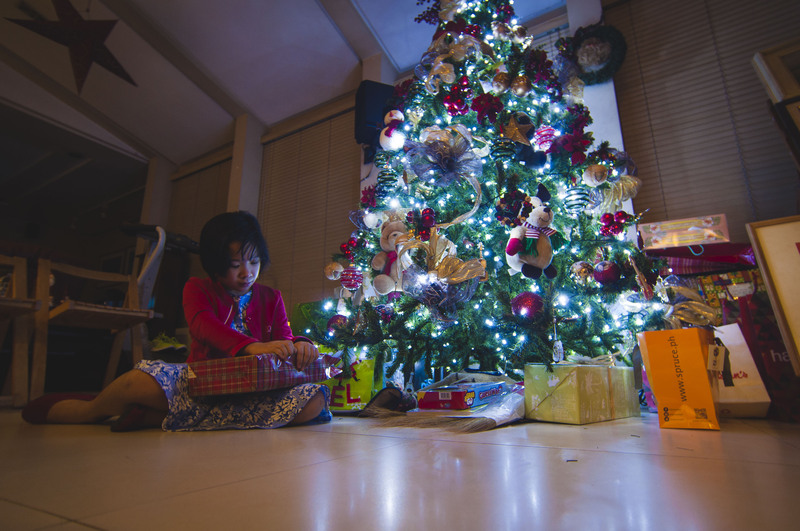 As kids, we were joyously at the receiving end of toys, clothes, and candies. As grown-ups, we now have the responsibility of buying and giving those toys, clothes, and candies. That’s one aspect of it, albeit a selfish and privileged view of it. But before you make any conclusions about how pessimistic, jaded, and cynical I am as a person, let me say what I came here to say in the first place. Growing up is about struggling – the struggle to understand, to try, to keep trying, to work, to love, to find something worth living for. I struggle these days to find the magic of Christmas, amidst all the shopping, the traffic, the holiday work. I never find it, though. It’s always in the most unlikely of places. This year, I found it in our driver’s smile. The most genuine smile I’ve seen shining from the man’s face through all his years of service. My brother and I had handed him our gift, and I suspect that it surprised him. I was surprised, too, by how much it had given him so much joy. Later that night, I received a text from him thanking both of us. A few years ago, I found it in the generosity of a little boy. A deadly typhoon had wreaked havoc in some provinces in the Philippines and there was a booth outside the church calling for donations after Simbang Gabi. I was in front when a little boy walked over, took out his wallet, and emptied out its contents, much to the amusement of his parents who were behind him. The meaning of Christmas shines through all the struggle. To us adults, the holiday is no longer picture-perfect, laced with tinsel, frosting, and blinking lights. It’s a muddled up image, a chaotic blur of things we need to do colliding with the things we want. But we have these moments – these little gems of experience that assure us that Christmas in itself is a gift that keeps giving, that even as adults we can still enjoy the Gift of Receiving. It’s never in the form we expect, but it always imparts a piece of something we strive for – love. And in the end, what is it all about? It’s the silence that follows the clamor, the peace that ensues after everything has been said and done. About a little boy in a manger who came in the quiet of the night, in the humblest of places, to bring us joy and help us in our struggles. To make music from the heart. The work of Christmas begins. I’m Trish Lim. I travel to gain new experiences, write fascinating stories, take captivating photographs. I set up this blog as a promise to myself to Make Things Happen and discover something new each day.